The ‘World Press Freedom Day’ is being observed on 3rd May every year across the world to raise awareness of the importance of freedom of the press. This day also seeks to remind governments their duty to respect and uphold the right to freedom of expression enshrined under Article 19 of 1948 Universal Declaration of Human Rights. The theme of the year 2018 is ‘Keeping Power in Check: Media, Justice and The Rule of Law’. 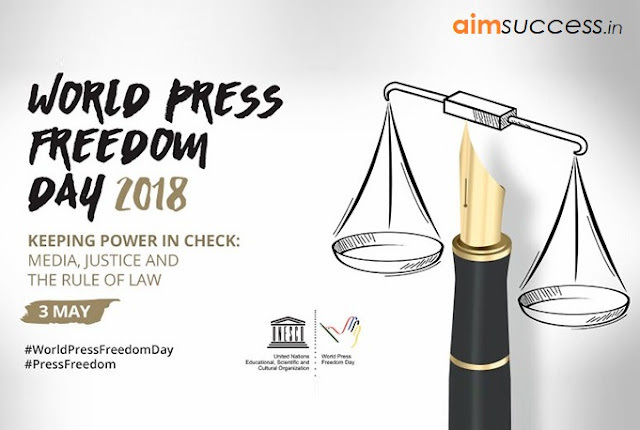 Note: World Press Freedom Day was proclaimed by the UN General Assembly in December 1993, following the recommendation of UNESCO's General Conference. The union Minister ‘Suresh Prabhu’, attended India- South Africa business summit in Johannesburg, South Africa. The Minister addressed the plenary session of the Summit and talked about building synergies between India & South Africa. The summit was a harbinger of good things to come and that South Africa & India were poised to take off in the next few years on a higher growth trajectory. Mr. Prabhu also inaugurated a multi-sectoral exhibition at Johannesburg. Note: The tag line of the India-South Africa Business Summit 2018 was “United by Legacy, Unified for Prosperity,”. UK marketing analytics firm ‘Cambridge Analytica’ has announced to cease all its operations immediately and filing for insolvency in Britain and the United States. This decision comes after the firm and Facebook became embroiled in a data-harvesting scandal that compromised the personal information of up to 87 million people. Currently, the firm is facing allegations of improper use of data on 87 million Facebook users which was hired by President Donald Trump’s 2016 US election campaign. Cambridge Analytica (CA) was a United Kingdom-based political consulting firm which combined data mining, data brokerage, and data analysis with strategic communication for the electoral process. The data about the 50 million Facebook users were acquired from 270,000 Facebook users who shared the data with the app "thisisyourdigitallife". By giving this third-party app permission to acquire their data, this also gave the app information about the friend network of those people, which resulted in information about 50 million users. Renowned artist-philosopher Ravinder Sharma (also called Guruji) passed away at his residence due to cancer. He was the founder of Adilabad’s Kala Ashram. In 2014, he had received the Kala Ratna from the Andhra Pradesh State government. He was also awarded the D. Litt (Honoris Causa) by the SGT University, Gurugram, Haryana. ICICI Bank's board has appointed ‘Radhakrishnan Nair’(63-year) as an additional (independent) director of the bank for five years. Mr. Nair had started his banking career with Corporation Bank in August 1976. In July 2005, he became an executive director at market regulator Securities and Exchange Board of India (SEBI). Mr. Nair is also an independent director of three subsidiaries of the bank ‘ICICI Prudential Life Insurance Company’, ‘ICICI Prudential Trust’ and ‘ICICI Securities Primary Dealership’. The Securities and Exchange Board of India (SEBI) has unveiled with a detailed framework for risk based Know Your Client (KYC) documentation of foreign portfolio investors (FPIs). In an FPI structured as a company, a person owning 25% stake would be considered the beneficial owner (BO). If it originates from a high-risk jurisdiction, any person owning 10% stake or more in such FPI would be considered a BO. All investors from such jurisdictions would have to comply with the KYC requirement for category-III FPIs. FPIs that do not comply with the new norms have been restricted to take new derivative positions from May 2018. The two-day national workshop on Data Requirements for Disaster Risk Reduction Database successfully concluded in New Delhi. It has set the stage for the creation of a national-level disaster database. Developing the integrated database with locally obtained and validated data is crucial for tracking the risks and progress towards resilience without which India will not be able to meet its developmental goals. The group will identify pilot States and draw a roadmap for implementation of the project. Maharashtra has become the first Indian state to provide digitally-signed land record receipts (known as 7/12 receipts) and accept a digital signature to check irregularities and bring in transparency. one can log on to mahabhulekh.maharashtra.gov.in. Information about the district, taluka, village and other details should be filled there, to get the document digitally. The document will be generated as a PDF. According to Badminton World Federation (BWF), two Malaysian badminton players (Zulkiffli,Seang) have been handed career-ending bans. They were found guilty of breaching the BWF code of conduct in relation to betting, wagering and irregular match results. Former world junior champion Zulfadli Zulkiffli (25 -years) was banned for 20 years and fined 25,000 Dollars. Tan Chun Seang (31-year) was barred for 15 years and fined 15,000 Dollars. Note: The panel found both players engaged in corruption offenses over a significant period and a significant number of tournaments dating back to 2013. The former left-handed opener ‘Justin Langer’ (47-year) has been named as Australia's new head coach for four-year. He replaced Darren Lehmann, who resigned in the wake of the ball-tampering scandal. Earlier, Australian Captain Steve Smith & vice-captain David Warner were sacked and banned for a year for their part in the controversy, while batsman Cameron Bancroft was suspended for nine months. Langer played 105 Tests for Australia, scoring 7,696 runs and retired from international cricket in 2007.